Good morning (or afternoon depending on what side of the Atlantic you're on) everyone, This will be my first model, along with my first thread on model making online! There will be many questions, and possibly something worthwhile looking at in the end. I have chosen to make a model based off of my nation's primary multirole fighter. I recently purchased a Canucks Models CF-188 special edition with the Battle of Britain decals. 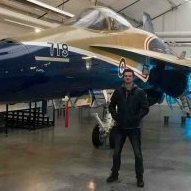 Plans are to order Canada's FIB Decal kit from Canuck models and base the model off of a CF-188 that participated in Operation Mobile. As for workspace, this is how I have been working, soon to change however as I am heading back to school today As for actual progress, I have assembled the seat, and have painted most of the cockpit black for further detailing I have found I love the assembly of parts, the painting on the other hand I am very unhappy with. I feel that the paint has gone on too thick, and that there is texture from the paint that makes it look messy. I am considering finding a way to strip the paint off the parts (they are only dry assembled aside from the seat) and having another go. I need to decide if I am going to go ahead and get an airbrush when I get my next paycheck, I have a feeling I won't ever be happy with brush painted models. Plenty to think about on the drive today! Comments and criticism are encouraged! 1/48 Hasegawa CF-104 1st Canadian Air Group TAM 1980 FINISHED! Time to throw my hat into the ring and actually make a decision as to what to build! I am going to build a Hasegawa F-104G as a CF-104 of the 1st Canadian Air Group which was based at Baden Sollingen in Germany. The aircraft I will be building is 104806 as it was painted during the NATO Tactical Air Meet at Ramstein from 20th June until 3rd July 1980, during this exercise the aircraft had a large letter C painted on the tail, and even more interesting colour wise the aircraft had a replacement starboard wing which was painted in a different camo scheme from the rest of the airframe (overall green as opposed to the dark green/grey over medium grey of the rest of the airframe). I will be using decals from Leading Edge 48-20 which has the markings I need for this aircraft and has resin parts for the RWR's carried by the Canadian CF-104's during this time. I shall post some pics of the kit and any goodies I decide to use soon. I won't be starting this kit for at least a couple of weeks until I can clear other builds off my bench so I thank you in advance for your patience and interest. Craig. I've had this one sitting around half finished for much too long. Finally I took the bit in my teeth, knuckled down and finished it. It's the Welsh Models kit straight out of the bag. The fuselage is the basic standard Welsh Convair 440/540 fuselage so the door outlines don't match the decals. I found that out too late. It's something I'll have to keep in mind when I do the 1/72 kit later on. My next entry in this group build is the MiniWing McDonnell CF-101 Voodoo, which actually is a re-release of an old FE-Resin kit. As usual, the kit comes in a cheap cardboard board with the only use of WordArt I've seen outside tacky flyers and parish newsletters: The fuselage is cast as a hefty single piece, though a piece of the tail was missing in the box (probably something wrong with the casting). The nose is a sepearate piece, probably because Miniwing also released an RF-101 with a different nose. The wings, nose and exhausts come on fairly inconvenient casting blocks, and it will be tricky to remove them cleanly. I will probably saw off a part of the casting block and file it off. Two vacuform canopies are provided, and I will need to break out a new scalpel blade for this. By the way, the tail's not warped as it seems in this picture, the fuselage isn't sitting perfectly flat. Strangely enough, only one seat is provided, and some pieces don't seem to have a place to be glued on to, like the two L-shaped blocks next to the part with the ventral strakes (just above the fuselage). Unless they're supposed to be seats. Instructions are a simple exploded view copyrighted to Erik Faustus, showing the kit's lineage. Confusingly, they indicate the jet intakes as separate parts but these weren't separate parts for neither the FE Resin nor this kit The kit offers two markings: a CF-101 from 409 Squadron and an all-black one (my choice) from 414 Squadron. The latter doesn't seem to be the EF-101 as the provided serial number is different from the EF-101's, and it's lacking an underfuselage pod and some bumps under the nose. I expect the decals, which are ALPS, to be awful, based on past experiences with decals from the same printer. Later Miniwing kits have their decals designed by JBr Decals. At the moment I'm trying to get off the wings, exhausts and nose from their casting blocks with a minimum of fuss while keeping their bases nice and flat. Hopefully it should be one of these 'goes-together-quickly-after-cleanup' kits.